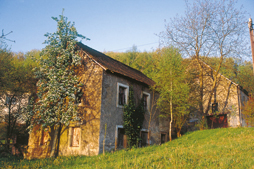 The old worker’s house in the « Chaussée St. Mar­tin” tes­ti­fies the sparse way of life and dwelling con­di­tions of the local work­ers at old times. 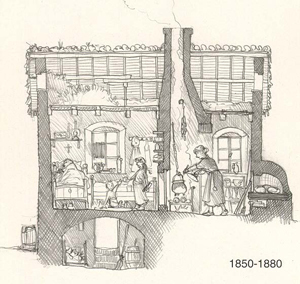 Dai­ly life in a worker’s dwelling in the mid­dle of the 19th cen­tu­ry. The sad­dle­back roof, made of tiles cov­ers the mod­est house, built with rough quarrystones.The low front side, scarce­ly high­er than a man, is divid­ed into one sin­gle door and two low win­dows. The side fronts had no win­dows. Many hous­es of that kind had their door in the mid­dle but the one in Hostert had its door more at the right and the win­dows at the left of the front side. Behind the entrance you could nor­mal­ly find the kitchen with its stove and the flue, serv­ing also for cur­ing meat and bacon. The sec­ond room was used as bed­room for the whole fam­i­ly. In the kitchen, being at the same time the liv­ing room, was a spe­cial cast-iron plate behind the stove called “Taak”, trans­fer­ring the heat to the bed­room. Those plates were often dec­o­rat­ed with bib­li­cal or heraldic motives. 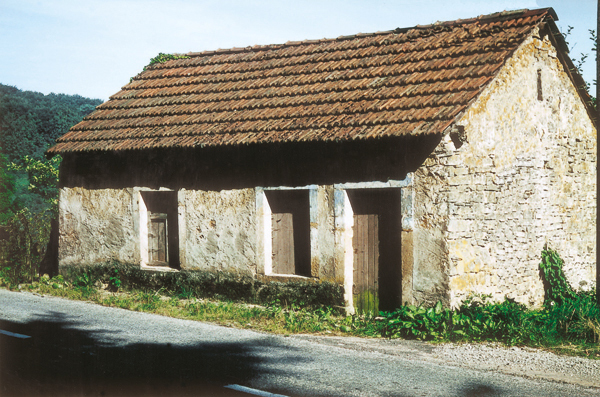 Many work­ers’ hous­es only had two rooms. Due to the steep­ness of the ground, the house here in Hostert could gain one more room in the base­ment at the back­side. 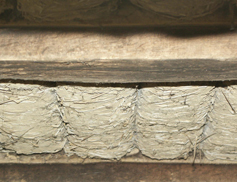 Wind­ed straw between the ceil­ing joists. Fur­ther up from the Hostert worker’s house, on the edge of the Hostert brook was stand­ing the old Hostert mill. The inside of the build­ing still shows between the ceil­ing joists rests of old straw and clay, a spe­cial com­bi­na­tion used once to cov­er the roof. 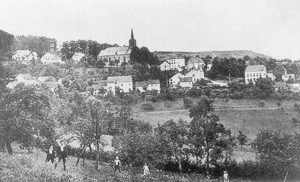 From the worker’s house you have a panoram­ic view over the orchards, the new quar­ter and over the Aar­nescht, on the oth­er side of the val­ley.